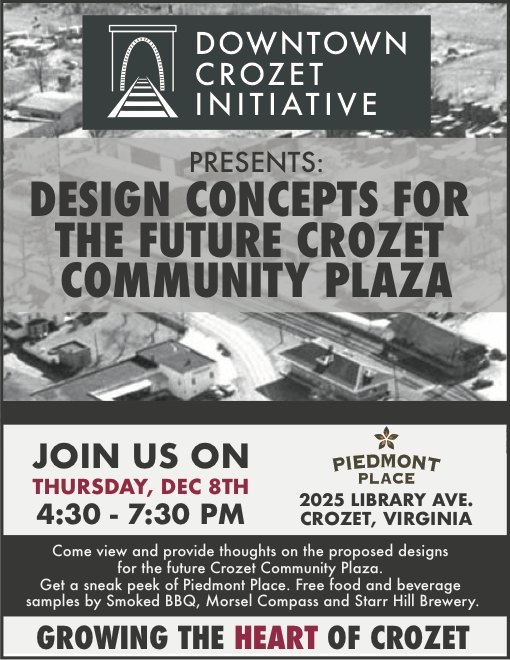 Come view and provide thoughts on the proposed designs for the future Crozet Community Plaza. Get a sneak peek at Piedmont Place (before their grand opening on Saturday, December 10) and the new Crozet Bicycle Shop. Free food and beverage samples by Smoked BBQ, Morsel Compass and Starr Hill Brewery. Hot cider and a fire pit will be located at the proposed site of the plaza on the Barnes Lumber property. The DCI is a committee of the Crozet Community Association (CCA). A Moment in Crozet History – Unfortunately Phil James cannot be with us tonight. Motion from last meeting (9/8/16) “The CCA should be the lead organization in Master Plan Revision for Crozet and to do so by creating a committee to guide the revision and survey the community with Tom Loach as the chair of the committee.” Crozet Master Plan survey committee final adoption/rejection. Additional CCA member on the Albemarle County Police Department Blue Ridge District Citizens Advisory Team. Meeting is Wednesday, Nov. 16 at 10 AM at Fifth Street office. Election of CCA officers occurs at our next meeting, January 12, 2017. Nominations are open for President, Vice President, Secretary, and Treasurer. Current officers are: President: Tim Tolson, Vice-President: Lisa Goehler, Secretary: Jo Ann Perkins, and Treasurer: Emery Taylor. Candidates must be present at the January 12 meeting or have spoken with a current officer about their willingness to serve if elected. Crozet Community Advisory Committee (CCAC) meeting Wednesday, November 16 at 7:00 PM at the Crozet Library. Details and notices on our website. Almost three years ago the Park’s board of directors solicited input via online survey from the Crozet community and the County at large regarding ideas for new amenities at community-owned Claudius Crozet Park. From that input significant capital improvements were triggered including new pavilions, a dog park, expanded parking and soon, a multipurpose perimeter trail. A pond-side amphitheater is planned for 2017. We are now soliciting input on the largest of these capital improvements, a comprehensive expansion of the Park’s aquatic and fitness center. Your input will directly guide our efforts.